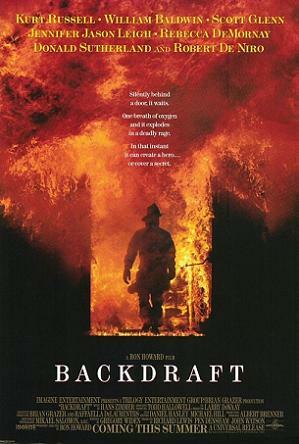 Backdraft – Did You See That One? Brian McCaffrey (Baldwin) has just joined the crew of Firehouse 17, the same station as his brother Stephen (Russell). The two have had a tense relationship since the death of their firefighter father when the two were children. Meanwhile, the city of Chicago has become the playground for a dangerous arsonist. When Brian is pulled from duty to help investigator Donald Rimgale (DeNiro) investigate the fires, the pair find themselves on the path of a skilled fire starter. Now they’re racing to uncover the person behind the fires before anyone else dies. This film was released in 1991, and became an immediate success amongst fans and critics alike. Director Ron Howard (A Beautiful Mind) took on the project, working with the screenplay by Gregory Widen (Highlander). The cast features a long list of well-known actors starting with Kurt Russell (Tombstone), William Baldwin (Forgetting Sarah Marshall), and Robert DeNiro (The Mission). The list also includes Donald Sutherland (Ordinary People), Jennifer Jason Leigh (Road to Perdition), Scott Glenn (The Paperboy), and J.T. Walsh (A Few Good Men). The story written for this film is a relatively simple one. The relationship between the brothers is interesting, creating some of the needed friction for the story. The mystery aspects of the film are also good, but do come off a bit predictably in the end. Overall, the movie works because of the action sequences and the emotional content of the relationships between the characters. The dialogue is nicely written and the characters are well-developed early in the movie. The mystery might not be too complicated, but the overall story works nicely. This is a well-acted film from pretty much everyone in the cast. Kurt Russell gives one of his better performances as Stephen, the rough cut older brother. His chemistry with Baldwin is also good in this one. The two play off one another the way that is expected between brothers. Robert DeNiro does a great job in his role in this one also. The film also features a great performance in a smaller role by Donald Sutherland. Jennifer Jason Leigh, Scott Glenn, and J.T. Walsh also do good work in their roles in this film. Overall, this one features great acting that brings the story to life nicely. The men playing the firefighters in this one also did a good job with the physical aspects of the film. From a technical standpoint, this film was a huge success. While the story might be a little too simple, the effects put this movie over the top. The fire scenes and the camera work done to capture them are amazing. Every action sequence is powerfully done, featuring great stunt work also. The film earned Oscar nominations for technical work, including Best Sound, Best Sound Effects, and Best Visual Effects. In addition, the film features a nice score from the talented Hans Zimmer (The Holiday). This is a really good movie overall. The weakness in the story makes this a bit predictable, but otherwise the film works nicely. I would suggest this to fans of movies with emotional drama and action mixed in. I would also recommend this to fans of Russell, DeNiro, Baldwin, or Sutherland. This is a fun movie that I’ve enjoyed watching over and over. I give this one 3.9 out of 5 stars. This was a awesome movie, great review! Thanks for checking it out. Despite the weaknesses in the story, this is a good watch. Pingback: Flatliners | Did You See That One? Pingback: The Hunger Games: Catching Fire | Did You See That One? Pingback: A Beautiful Mind | Did You See That One? Pingback: Bone Tomahawk | Did You See That One? Pingback: The Hateful Eight | Did You See That One? Pingback: In the Heart of the Sea | Did You See That One? Pingback: Dunkirk | Did You See That One? Pingback: Training Day – Did You See That One?